In the ’80s you knew were in for a stupid good time when the first words on the screen were “a Golan-Globus Production.” The Cannon Group gave us unforgettable films like Lifeforce, Bloodsport, and Masters of the Universe. Those were some of their big budget efforts- Enter the Ninja, The Last American Virgin, and Breakin’ 2: Electric Boogaloo are more what they’re known for. 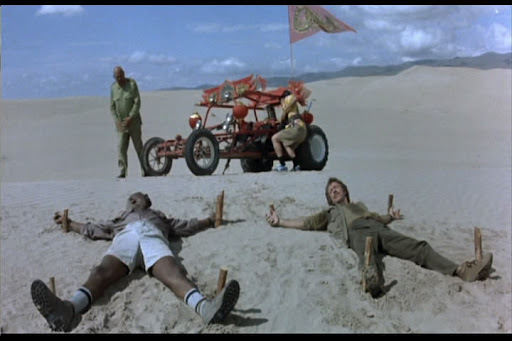 And Firewalker- an Indiana Jones style adventure starring Chuck Norris and Louis Gossett Jr. as treasure hunters on a gold-seeking caper full of wacky hijinks. It’s a much needed dash of humor in Norris’s run of ’80s kickfests. We meet adventurers Max Donigan and Leo Porter in a Jeep in the desert as they flee a convoy of gunmen in dune buggies. They’ve been partners a long time and bicker like husband and wife. Leo says to turn left; Max makes the rather astute observation that in a desert, does it really matter? But it does, because they make a right turn at Albuquerque and crash right into an oasis. They are captured and staked out over convenient ant hills by their nemesis The General, who is a Chinese general, as you might imagine. The comic tone is set early on as Max (Norris) says, “he’ll probably say something cheesy like ‘Gentlemen, we meet again,'” and he proceeds to do exactly that. 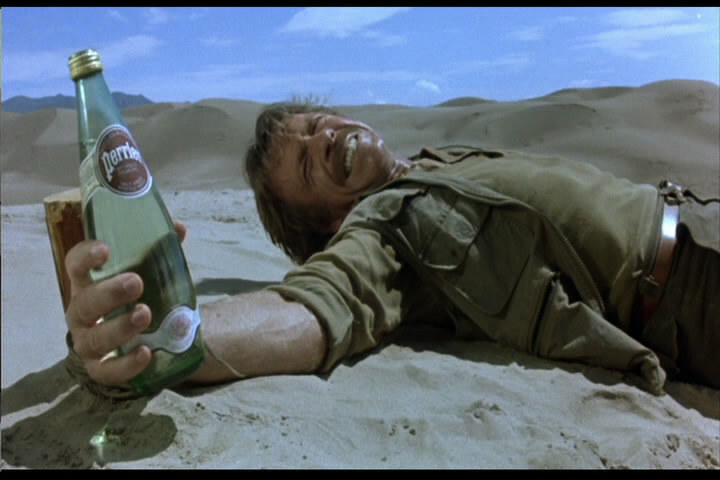 Perrier is Chuck Norris’s Kryptonite. The story may be slapdash and derivative, the lines hackneyed, the stunts and effects cheesy and low budget, but there’s genuine comic chemistry between Max and Leo that sort of holds things together. Gossett has always excelled as the second lead and he makes great use of what little he’s given here. 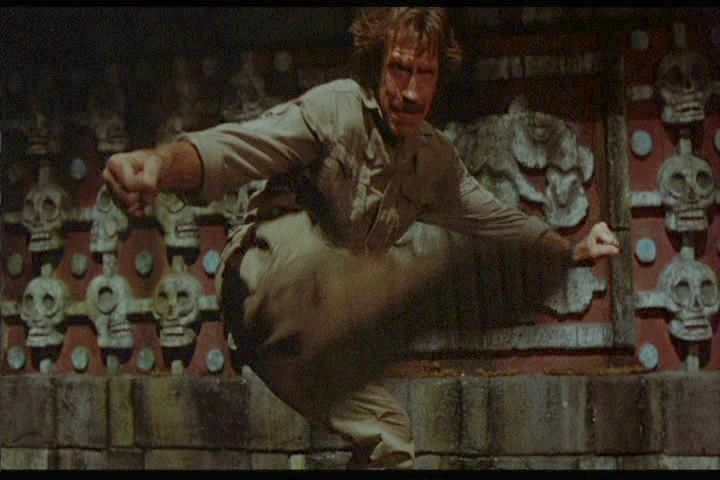 And hell, Chuck Norris to me has always worked best with a little tongue in cheek. While I don’t have the tolerance of Jason over at Invasion of the B Movies, who had a whole Norris month, I’ve watched some of his goodies and baddies like Good Guys Wear Black, Lone Wolf McQuade, Code of Silence, and The Hero and the Terror. Where would I rate Firewalker? Somewhere in the middle. For one, Melody Anderson, who played Dale Arden in Dino De Laurentiis’s Flash Gordon flick- you know, the one with the Queen soundtrack- plays Patricia, who hires Max and Leo to help her find a lost treasure of gold. She’s not the greatest actress, but manages to be funny here and there, like when she’s dressed as a nun to sneak through the Nameless South American Dictatorship- let’s call it Val Verde- that they must traverse. Max and Leo dress as priests, and Gossett has to give last rites in Pig Latin, which sounds funnier than it is. Director J. Lee Thompson, who gave us The Guns of Navarone and Cape Fear, coasted for a long time after those hits and this is smack in the middle of a period where his most memorable movies are the ’80s horror holiday flick Happy Birthday to Me and the so-bad-it’s-good Death Wish IV: The Crackdown. I get to dress like Indy? 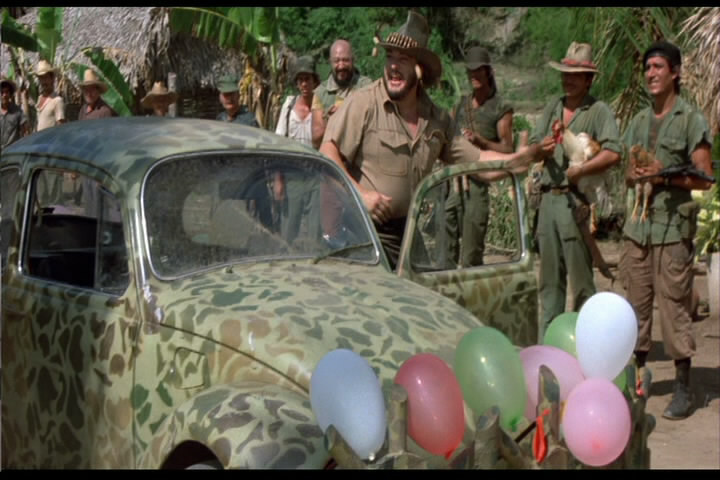 And drive a camo Beetle with balloons? Sign me up! But Firewalker is not without its charms. Being a Chuck Norris movie, he has to kick the asses of an entire bar full of patrons, but it says something when it’s more fun watching Louis Gossett Jr. get knocked around because he won’t ask for help. They find an Indian medicine man, played by Will Sampson of Poltergeist II: The Other Side and One Flew Over the Cuckoo’s Nest in his final role, who tells them how to find the treasure. And to beware of its guardian, the Firewalker. I think. The bad guy is called El Coyote, and played by Sonny Landham- Billy from Predator– and like Mola Ram from Temple of Doom, he can pull your brain out through your nostrils with his fingers. At least that’s what it looked like; maybe he was just digging for gold. I ain’t afraid of no man. Or his boogers. Along the way, they get rescued by old friend Corky Taylor- John “Sallah” Rhys-Davies with an absolutely hilarious Southern drawl- so there are some small rewards for suffering through this movie. It’s just unfortunately pretty boring and predictable; the script is threadbare and the director doesn’t know much about comic timing, to give his actors their due. 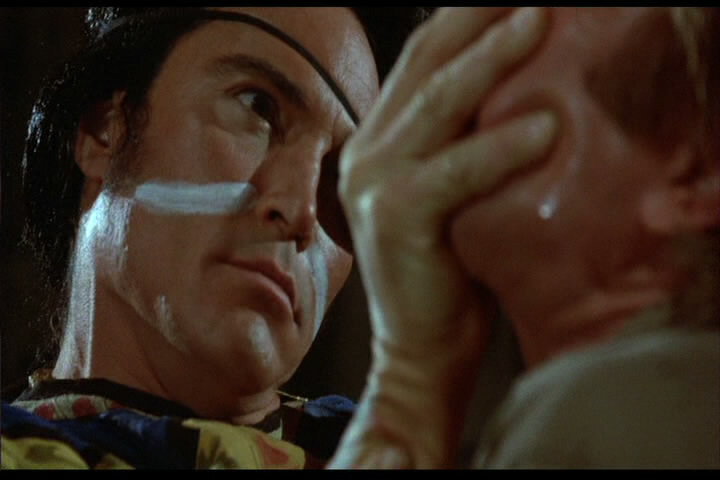 I’ve certainly watched worse movies from the ’80s, but without Norris and Gossett bickering this would be intolerable. It’s barely worth making fun of, because you feel bad for them. They really tried, but you can’t polish a turd. Golan-Globus did best when they went full-on exploitation as in Lifeforce; this kid-friendly flick might have appealed to young’uns who liked Norris, but otherwise it’s best forgotten. High Points: Norris and Gossett Jr. bickering.